I felt a little uncomfortable to post so many of them here in one thread. That's easy enough to fix, comrade, just start your own thread. This one is for watches still for sale, especially the very rare and/or valuable ones. Bostok, mroatman and soviet like this. Have to agree. Kinda misses the point of this thread to post your own pieces. Dear Comrades, Good advice! 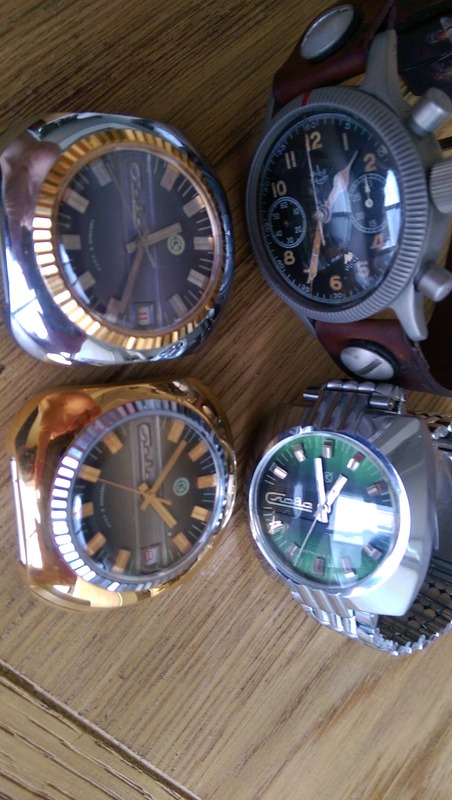 This thread inspired my old memory for beautiful Soviet watches (dials). They have slepted for too long on a shelf. schnurrp, mroatman and kev80e like this. mariomart, miquel99 and Fergfour like this. Whats that Comrades'? its a joke, franken or Unicorn...? I would say fake. I can't think of a Vostok movement that would fit in this frame. This is a ladies watch. Oh wow, I had never seen one of these before. Nothing on Mark Gordon's site, or that I can find in the forum history. The aging on the dial is too perfect for it to be a modern replica. I have no idea what to make of this. Maybe a woman's watch? I did manage to find one of these on eBay (closed listing) with some additional photos. I think it may be the same watch, in fact? Were you the buyer? It very strongly reminds me of my Zvezda; the way the caseback has a cut-out for a very Zvezda-like movement. The lack of any finishing on the movement also strikes me as very Soviet, although I don't recognize it, and to my knowledge, Chistopol never made one of these smaller, rectangular movements. In any case, great find! Thanks for sharing! Good try, but this Vostok is so unique that the logical answer, for me, is the obvious one.